Belying the stereotype, of course, African American household workers were not content and loyal, and resistance was common. It often took the form of individualized, day-to-day opposition to work expectations, such as refusing to do certain kinds of tasks or refusing to live-in. But household workers also organized collectively. As Tera Hunter has recounted, African American washer women in Atlanta in 1881 formed a washing society and went on strike to demand higher rates for their labor.1 In the 1930s, a number of domestic worker organizations were formed to counter the rise of what journalists Marvel Cooke and Ella Baker called “slave markets,” where African American women stood on street corners to be hired as day laborers. Cooke and Baker described the experiences of these domestic workers: “Under a rigid watch, she is permitted to scrub floors on her bended knees, to hang precariously from window sills, cleaning window after window, or to strain and sweat over steaming tubs of heavy blankets, spreads and furniture covers. Fortunate, indeed, is she who gets a full hourly rate promised. Often, her day’s slavery is rewarded with a single dollar bill or whatever her unscrupulous employer pleases to pay.”2 In the postwar period, given the context of black freedom organizing, African American women began to more systematically challenge the racialized nature of the occupation and the notions of servitude that characterized domestic service. In the 1960s, household workers established local organizations to demand higher wages, contractually-based employment, federal labor protections, and recognition of the value of their work. Geraldine Roberts grew up in Arkansas and attended segregated schools. She left home at a young age, married, moved to Cleveland, and divorced. As a single mother, she had little opportunity to complete her education and ended up doing domestic work. As a domestic, she was not treated like a worker with rights, but as a servant whose body was the property of her employer. She described one job interview when an employer, after examining Robert’s teeth, told her: “Any girl… with a mouth this clean and pretty clean teeth was a pretty clean gal ’cause I don’t like dirty help in the house.”3 The story conjures up images of the slave auction block where slaves’ physical health, including their teeth, was closely examined by potential slave buyers. Roberts recounted the way employers routinely used physical separation to maintain a racial hierarchy: “There was a back room that was the bathroom, that would be the bathroom for myself and… other household employees… all black, and we were all told to use that bathroom, and to never use the family bathroom.”4 Roberts became involved in the civil rights and black power movements and drew parallels between Jim Crow segregation and the racialized nature of household labor. In 1965, she started the Domestic Workers of America to mobilize other household workers in Cleveland. 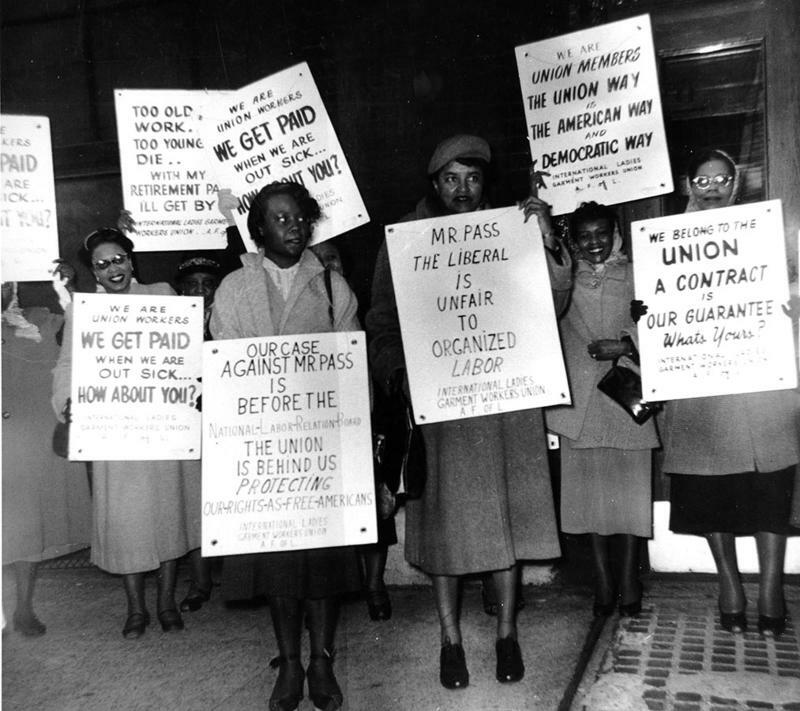 In Atlanta, Dorothy Bolden rode the city bus lines to recruit workers for her new organization, the National Domestic Workers Union of America (NDWUA). Bolden began domestic work at the age of nine. When the civil rights movement emerged, she worked closely with Martin Luther King and members of the Student Nonviolent Coordinating Committee to ensure equal access to education in Atlanta. But it was her organizing of household workers where she made a name for herself. In 1968, she established a city-wide organization that insisted on a minimum wage of $15 a day plus car fare, and developed standards for the occupation. In their testimony in the early 1970s, members of the HTA and their allies presented their vision of the importance of household labor and the need for this occupation to be treated the same as all other work. Edith Barksdale Sloan, an African American civil rights activist who headed the NCHE and facilitated the formation of the HTA, said her in her testimony that domestic work should be afforded the same rights of social citizenship and New Deal benefits as other occupations: “Pay must be increased to provide a livable wage… workers must receive the so-called ‘fringe benefits,’ which long ago stopped being ‘fringes’ in every other major American industry. At this time, household workers usually do not receive paid sick leave, vacations, or holidays. Coverage under unemployment and workmen’s compensation is extremely limited and varies widely from state to state.”6 These views were echoed by Carolyn Reed, a domestic worker and organizer based in New York: “I feel very strongly that I contribute just as much as my doctor contributes, you know. And that because he is a doctor does not make him better than me, as a household technician.”7 In 1974, Congress finally passed amendments to the Fair Labor Standards Act (FLSA) that federally guaranteed minimum wage for domestic workers. The domestic workers’ movement’s emphasis on revaluing forms of social reproduction resonates especially at a moment when good-producing industries account for less than 13% of U.S. employment.14 Valuing the paid and unpaid work of social reproduction, whether it is that of fast food workers, landscapers, home care workers, or housecleaners, is the first step to considering them part of the labor movement and including them in our conversation about how worker power can transform the economic climate.